Navodaya Vidyalaya Samiti (NVS) has released notification for the recruitment of Principal, Post Graduate Teachers in Jawahar Navodaya Vidyalayas and Assistant Commissioner (Administration), Assistant & Computer Operator in NVS HQ/Regional Office. NVS invites online applications from Indian citizens for recruitment to the posts of Principal, AC (Admin), PGTs, Assistant & Computer Operator for the year 2019. Total No. of Post is 251. Interested candidates may apply online from 15 January to 15 Feb 2019. Note: For More details of Post Wise & Category Wise breakup of tentative vacancies please read the official notification below. Persons having 15 years combined regular service as PGT (Level-8 in the Pay Matrix) and TGT (Level-7 in the Pay Matrix), put together, out of which minimum 03 years as PGT. At least three years’ experience as House Master of a fully residential school. Experience of working in a fully residential/CBSE affiliated/Govt. recognized school. Possessing experience of handling Administrative / Financial matters in a responsible capacity in Central / State Govt. / Autonomous / Statutory Organization. 3 years’ experience in administrative, financial matters in Central Government / Autonomous organization under the Central Govt. Degree from a recognized Institution / University. Skill in word-processing & data entry with a one-year Computer Diploma from a recognized Institution. Desirable: Familiarity with various software packages. PGT (Biology) PGT (Biology) Botany / Zoology / Life Sciences / Bio Sciences / Genetics / Micro Biology / Bio-Technology / Molecular Bio / Plant Physiology provided that applicant had studied Botany and Zoology at Graduation level. ‘C’ level from DOEACC/NIELT Ministry of Information and Communication Technology and Graduation. 2. Proficiency in teaching in Hindi/English. Note: For subsequent promotion, the incumbent will have to acquire B.Ed. degree. Experience as TGT in a recognized institution in concerned subject. Candidates will be shortlisted on the basis of their performance in written examination and interview put together. Please check the official notification given below for the Written Exam pattern. 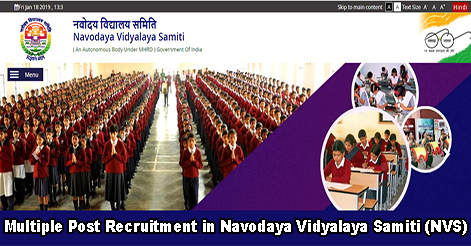 Candidates are required to apply Online through Navodaya Vidyalaya Samiti’s (NVS) website at www.navodaya.gov.in and www.nvsrect2019.org from 15 Jan to 15 Feb 2019. No other means/mode of application will be accepted. The online applications should be filled carefully. Scan and upload your recent photograph, signature, and thumb impression at the appropriate places as per instructions contained in the online application format and submit the same Online. For General Candidates – Principal-Rs.1500/-, Assistant Commissioner (Administration)-Rs.1500/-, PGTsRs.1000/-, Assistant-Rs.800/- & Computer Operator-Rs.800/-. Help us to improve this article/job posting "Multiple Post Recruitment in Navodaya Vidyalaya Samiti (NVS)". We would be glad if you can comment below and provide your valuable suggestions and feedback. If this page have any wrong information/list or out of context content, then you can report us as well. sir i have applied post but my location dehradun so where is my interview and exam city centre.